Optional: dried roses, flowers or other pretty things. I'm just going to help you out and tell you exactly what I ended up doing. First, you'll need to order the citric acid online since it's near impossible to get it at the grocery store (we used about a half bag to make 72 half molds (discs)) because even they have to special order it at the pharmacy. Plus if you're an amazon freak like me I'd rather order it there anyways! I've put links on each item to be ordered via amazing if you too are a freak like me. Combine dry ingredients. Dump all of your dry ingredients (citric acid, corn starch, Epsom salts and baking soda) into a big bowl and stir together with your whisk. Combine wet ingredients. 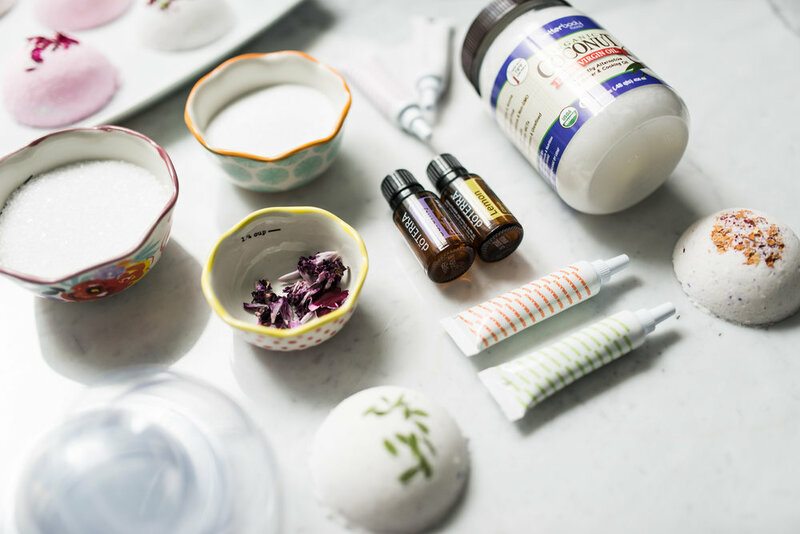 Place all of your wet ingredients (water, essential oil/perfume, cocnut oil and food coloring) into a cup and stir until well mixed. Pack mixture into molds. If you are adding dried flowers put those in the bottom of the mold. Then pack the mixture as tight as you can into half the mold. Note: You can make full balls by packing each sides of the mold and then putting them together. One side will need to overflowing a bit in order for it to stick. Let dry. Wait a few minutes, and then carefully remove the bath bomb from the mold. Place them on wax paper on top of a fluffy towel. Let the bath bombs dry for at least one day before you use them! If your bath bombs are a gift, wrap them in cellophane or tissue paper. To store them, keep them in a plastic, airtight container. We made these particularly for my upcoming baby shower as thank you gifts but I think I'll make another batch to use as gifts for friends and family around the holidays since they turned out so great! They would be so handy to keep on hand to give to the co-worker who suddenly shows up at your desk with a small gift for you but you've got nothing to give them. Why not have a stack of these sweet things on hand to give back? Click here for a FREE pdf of this label design.